There is another one out, as we speak, it being officially released at Salute this month. 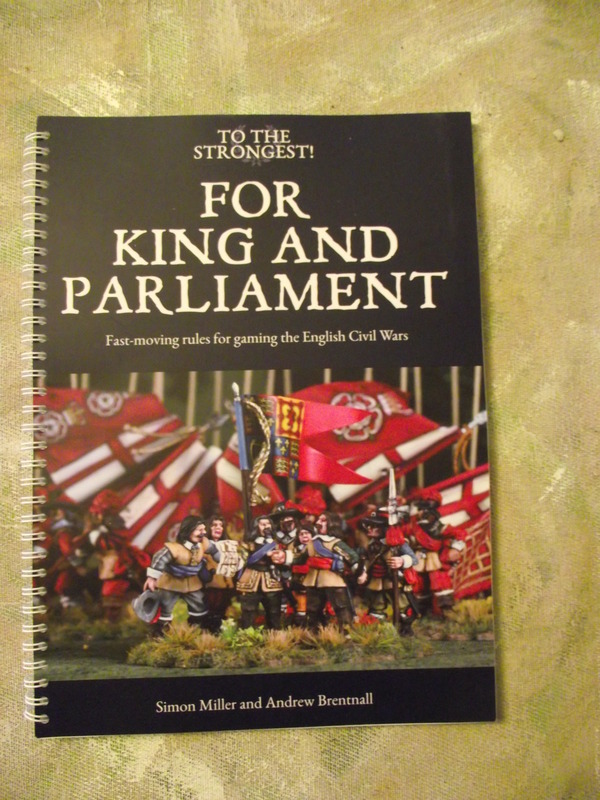 Now, apart from the title being ‘For King and Parliament’ rather than ‘For King OR Parliament’ (after all that is what the war was about) this set has all the high production values and well written rules and examples of the first. 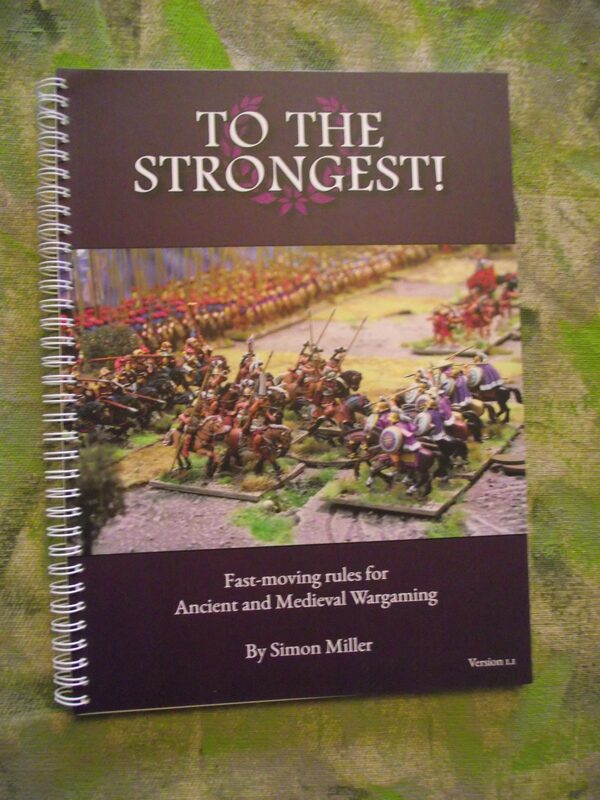 I was concerned that it would be effectively the same rules with a different cover, because I could see how ‘To the Strongest’ dealt with large bodies of men shooting, charging and stabbing each other on the battlefield. It wouldn’t be much of a leap to make them a home-made ECW rule set. However I have been pleasantly surprised that some real thinking has gone into these and an effort to make them represent 17th C warfare whilst still retaining the simple structural framework of the original rules. The transfer from one rule set to another is simple and fairly painless. However, I feel if you hadn’t played/seen the original set before them maybe it might be more difficult – its written in a less direct manner. For example the rule about unit activation in ‘To the Strongest’ makes it clear that a 2+ is required to activate, in ‘For King and Parliament’ it states that an Ace fails for activations. Both mean the same thing in effect but do show perhaps a maturing in the rule writing process by the authors. Like the original rules you use drawn cards to activate moving, firing, rallying and melee. First you have to activate, and then draw a card as to the success or not of your order. As long as you keep getting higher than the last activation draw you can keep going. Anyhow, like ‘To the Strongest’ (TTS) it defines unit types and allows you to define how many figures bases you want to represent them based on the size of the grid you are using. This, for me in the rules, is a Forlorn Hope, a 1 hit 2 ammo wonder shoved out in front to disrupt the other side. 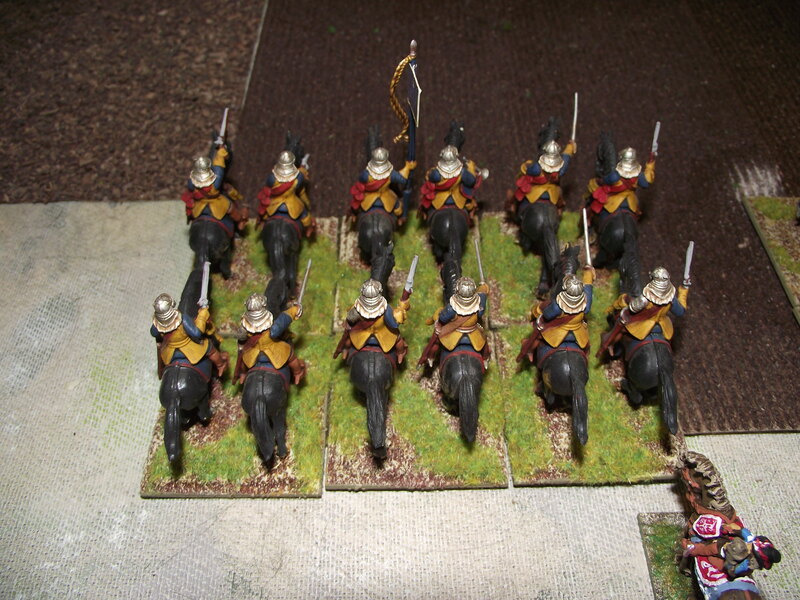 Basic bog standard cavalry unit – there is a difference between ‘Dutch’ and ‘Swedish’ horse. More about that later. And yes there are lancers and cuirassiers. And then you get into the foot units. Above is my version of the rules ‘pike heavy’ battalia. 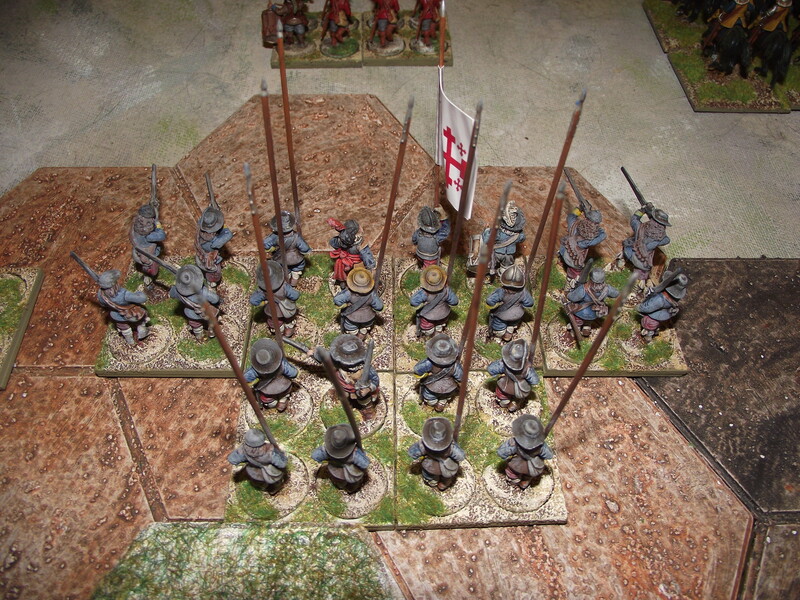 A 2:1 ratio of pikes to muskets. 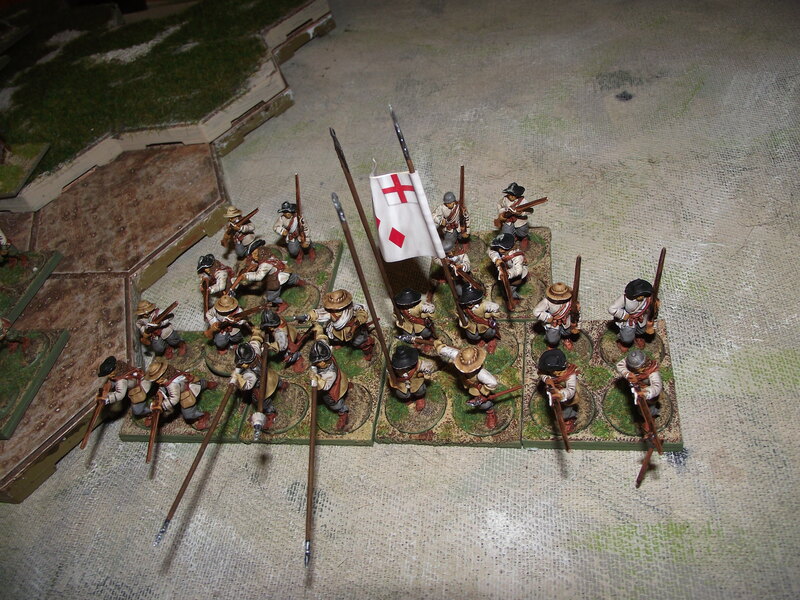 And this my version from the rules of a standard battalia, 2:1 musket to pike ratio. 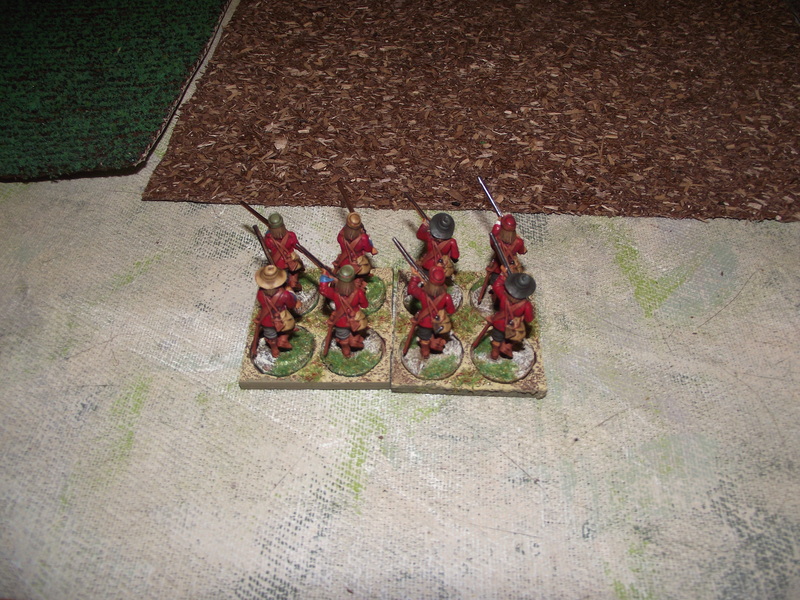 Obviously you can also have commanded shot units – which just look like bigger Forlorn Hopes. For information I am using 8″ (20cm) gridded squares and 28mm Figs. The rules include a sample battle which I laid out to play. 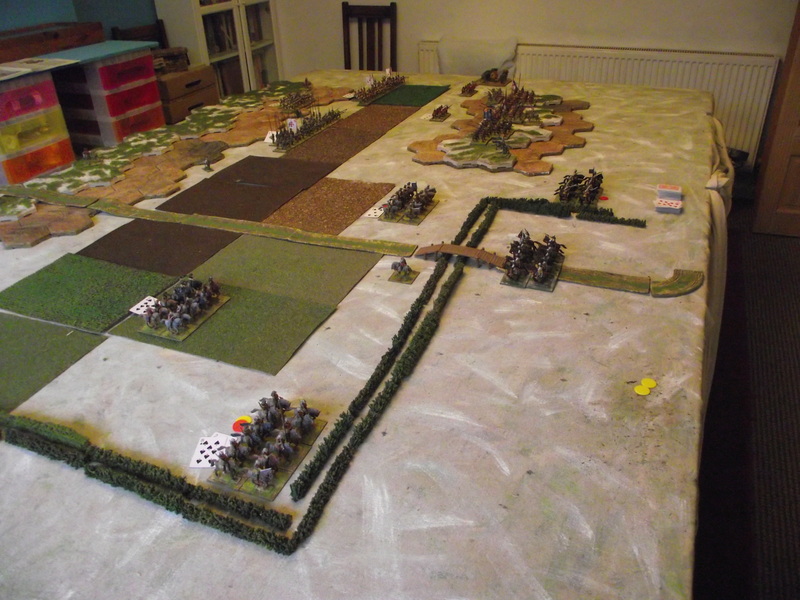 This is after the first move and the Royalist cavalry (to the left) has stormed forward, and is in the process of going through and past the Parliamentary horse. So how does it work. Well here, below, we have a Royalist Swedish style horse unit attack a part of a Parliamentary Swedish style horse. If the Parliamentary horse was Dutch style it would stand and fire at the Royalists on the way in, as it isn’t it counter charges. In the rules each horse unit has a number of ‘dash’ counters, these represent the horse charging in and can be used to improve the number of card you can hit with. Once they are used that is, you horse is blown, you can still move but you’re not going to get any impact addition. Each unit also has a pistol firing capability – represented by ammo markers. These can be used, but again once used they are gone. 2 cards base for melee, 1 card for ‘dash’, 2 cards for using guns in the melee (Swedish style use their guns in the melee, not like Dutch style using them before the melee). 5 cards at 8+ for each side. The attacker draws first, if there is a hit the survivor has to save – if he fails he gets hits – cavalry can take 3 hits before they are dead. However, 1 hit will disorder them and make the to hit score a 9+. If the melee does not kill then it is assumed the two side draw apart and stop fighting. If one side however loses then they are removed, and the winner ‘pursues’ until rallied or falling off the table edge. All that sounds slow and cumbersome, and a bit, meh, so what all other rules do that. What you need to remember is that all the above could happen from one activation. I could draw a 2 for my first activation to charge the Royalist cavalry into the Parliamentary horse, have the melee, and then keep activating and attacking. As long as I draw a higher activation card each time I can keep moving/attacking/firing etc. So stuff can happen pretty quick, and pretty brutally. Units are combined in commands, so when the first unit in that command fails to activate that ends the turn for that command – so juggling resources and priorities is essential, as is keeping reserves. Imagine having fresh horse ready to pounce on tired (‘dash’less) and ammo less enemy horse. I reckon a good tactic would be to charge on a low activation draw, allowing you to rally the unit when (if) it beats the enemy horse and starts to pursue. Effectively you would be ‘doing a Cromwell’ and holding the horse so it can wheel round on the infantry. Above the infantry start to get to terms. You get ammo counters like the cavalry for the infantry, but it is assumed that at 1 square distance you are firing without using this ammo. These counters are used for long-range fire, double fire if veteran or (something I had not heard of for ECW) Salvee, where the unit double fires and then charges in the same activation. The actual difference between a pike heavy unit and a standard or even shot heavy unit is the number of ammo counters, which means I think the pike heavy units are at a disadvantage, they have no bonus even in melee. 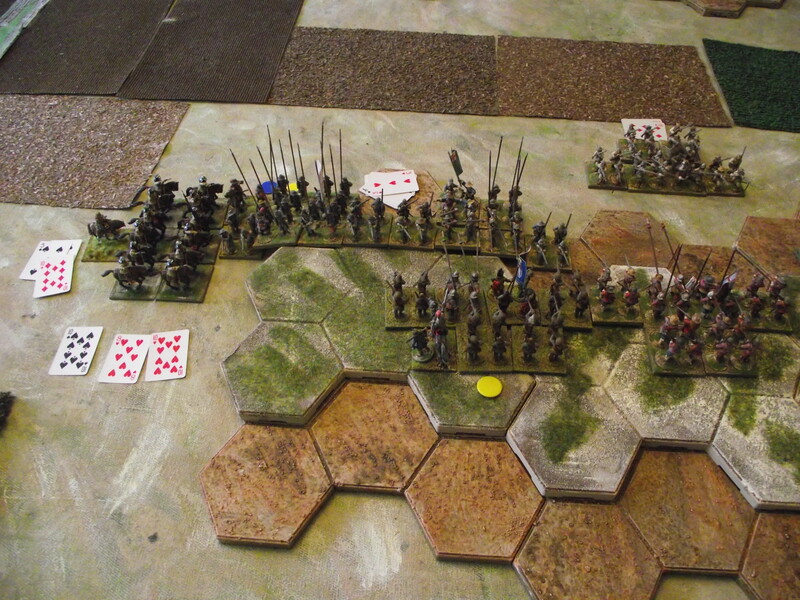 However, I am still eking out the nuances of infantry combat. 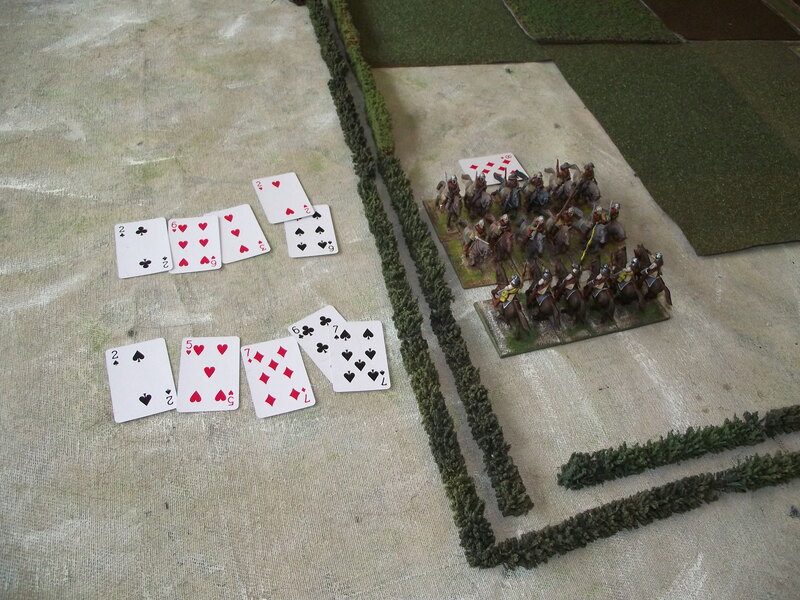 And here I am ‘doing a Cromwell’ with the side of the Royalist infantry – flank attacks double cards!! As you can see 3 hits (8+) which if the infantry unit does not save would kill it outright as it only has 3 hits. It’s a brutal game. 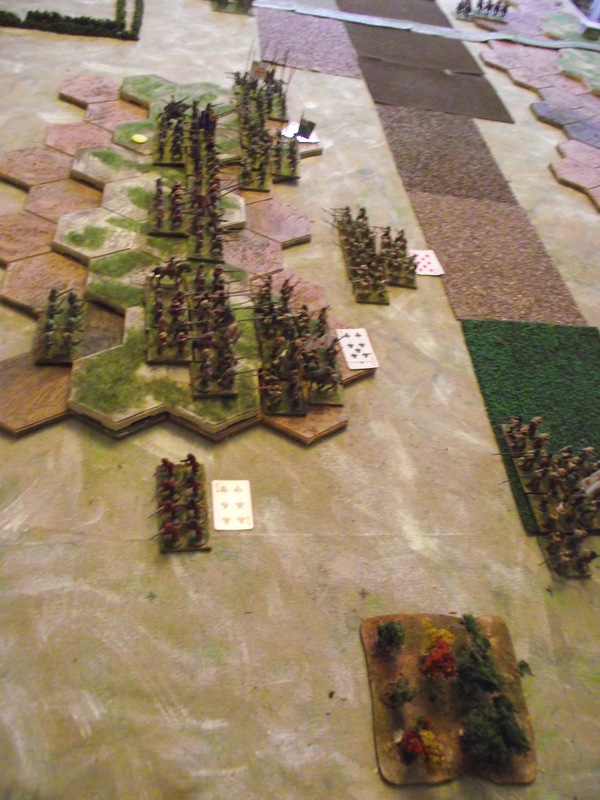 It requires a fair few counters/markers for each unit – ammo, dash, whether green or veteran and hits. I am going to ponder on how to show all that whilst being unobtrusive. Does it depict warfare as found at Naseby – dunno I wasn’t there. Does it give a good clean game, nice and large and over to a result in an evening, yes. Can it be tweaked to represent your own historical prejudices interpretations, yes. Will I be playing this again , yes. If you are good I’ll do a proper play through! !